On Wednesday, December 14, CED will showcase the 13 graduates of the Fall 2011 FastTrac® program. FastTrac® is a comprehensive business planning program that addresses the needs of start-up entrepreneurs who are refining their business ideas, writing their business plans and seeking to grow sustainable high-impact companies. CED runs this program to support and sustain the entrepreneurial community of the Triangle and to enable would-be entrepreneurs to take the first step towards preparing their company for growth. 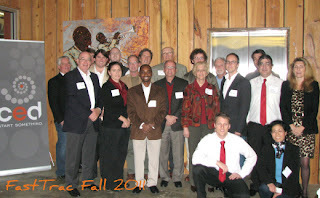 For more information or to apply as a Spring 2012 FastTrac® participant, mentor, or facilitator, please indicate your interest after reviewing this information. We're proud to celebrate the Fall 2011 graduates! Scott Bublitz, Exam Design, Inc.
Providing examination development software used in high-stakes hiring decisions. Aims to change the way performance management happens. Small renewable energy company that produces biodiesel in Central North Carolina. Integrates technology in education, training, presentations, and simulations. CRO offering cell culture and cell engineering services. One price online tax preparation. Crowd sourcing approach to idea collaboration. Developing new business matching software to greatly improve and stimulate the business networking environment. Involved in a paradigm shifting Facebook commerce app. Online site providing connection to water sports. Developing a novel set of articulated hand-held endoscopic surgical instruments. Developing a device that operates on UVC light that disinfects and sanitizes any article that fits in 30 seconds. Delivering ideas that connect brands and consumers in both rational and emotional ways.